Thomas Dunne Books, 9780312376925, 496pp. BUT WHAT SHOULD WE BELIEVE? ONCE UPON A TIME, maintaining your health seemed relatively simple. But today we're barraged by a never-ending array of conflicting medical advice. It's all terribly confusing, and most of us aren't sure what news we can trust and what we can ignore. "Doctor Chopra Says "offers a solution that will help you make the right decisions for your health. - Is wine the best medicine? - Which cancer screening methods are effective? - Is there a "best" diet for you? - Are statins the new miracle drug? 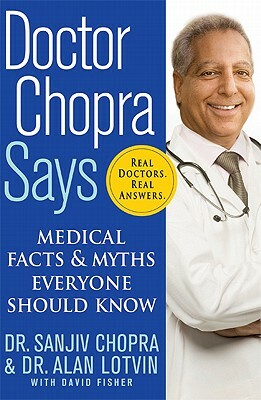 Filled with authoritative advice from many of the top medical experts in their respective fields, "Doctor Chopra Says "gives you the tools you need to lead a healthier, happier, and longer life. and health ESSENTIALS revealed . . . MYTH: Megadoses of vitamin E might stave off some cancers, Alzheimer's Disease, macular degeneration, and other serious health problems. FACT: Taken regularly over a long period of time, vitamin E supplements of more than 450 mg can be extremely dangerous. MYTH: Drinking too much coffee has been linked to health problems, including heart attacks, birth defects, pancreatic cancer, osteoporosis, and miscarriages. FACT: People who drink coffee have significantly reduced their chance of developing liver cancer. MYTH: Vaccines may cause extremely serious health problems, including autism. FACT: There is absolutely no evidence of a link between vaccines and autism. MYTH: People can get enough vitamin D3 from exposure to the sun for fifteen minutes a day. FACT: During the winter, people living north of about 35 latitude cannot get the necessary UV light from the sun. DR. SANJIV CHOPRA is professor of medicine and faculty dean for continuing medical education at Harvard Medical School, and a senior consultant in hepatology at the Beth Israel Deaconess Medical Center in Boston. He has more than one hundred publications and four books to his credit, and is the editor-in-chief of the hepatology section of "UpToDate, " an innovative Internet program that is subscribed to by more than three hundred thousand physicians around the world. In April 2010 he was honored with election as a master of the American College of Physicians. He lives in Weston, Massachusetts. DR. ALAN LOTVIN is a cardiologist. He holds a graduate degree from Columbia University and is the chief executive officer of ICORE Healthcare. He was president and chief operating officer of M/C Communications, a leading medical education provider, and prior to that was president of Specialty Pharmacy Services for Medco Health Solutions. He lives in Hopkinton, Massachusetts.